A care package is not a response platform. A lot of emergency response trailers are glorified storage bins. They are organized. They arrive clean. Some of these trailers have cabinets full of supplies, with plumbing, wiring and sometimes a generator. However, they all require a reliable logistics supply line to have any functionality after 4-6 hours of in-theater operations. Sadly, disasters have a way of compromising logistics and exposing these solutions to mission failure. The consequences of first responders becoming part of the failed infrastructure they are trying to support is catastrophic. to create a robust, self-sufficient Mobile Response Unit (MRU) that can respond singularly or as a unified camp. These MRUs have redundant utility production capability for communications, water, and power. These units can literally function as a rolling grid for mission critical utilities. An RV cannot go off road and requires its own fuel, oil, and engine maintenance. Medically equipped, retro-fitted containers require forklifts and flatbed trucks for delivery. Tractor/ trailers with pop-out sides require certified drivers and are a struggle to transport in poor road conditions. All of these factors were considered when the platform was built on top of a reinforced 24-foot trailer chassis. The MRU is deliverable with a pick-up truck. 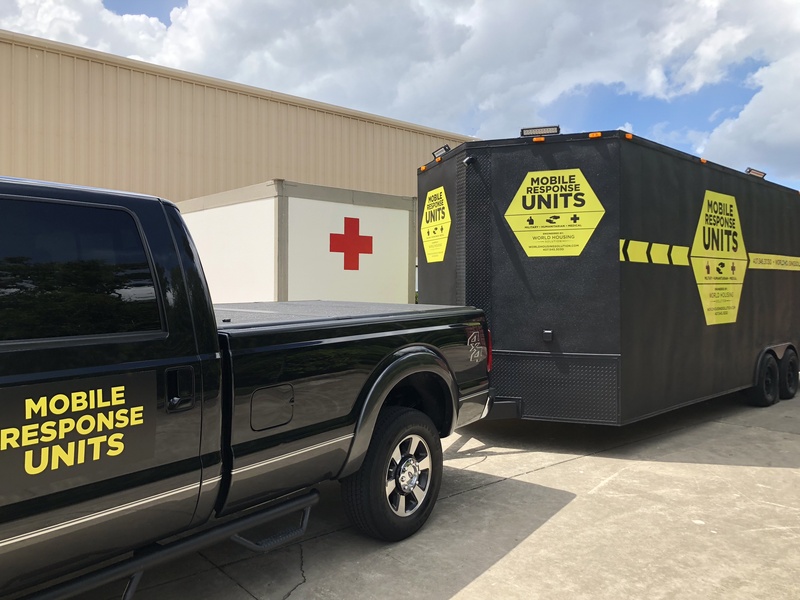 It can be towed by a standard licensed driver and is easy to move around or reposition on-site as situations change, as is common during disaster response. Power starts with a 10Kw battery back-up bank that produces a clean power wave regardless of the power source. This clean power is critical for sensitive electronic equipment such as medical ultrasound equipment and communication modems. For power manufacturing redundant solar is used and enhances generator capability. These solutions feed power to the batteries and ensure ongoing power, regardless of the local grid. Water is potable and carried in an on-board bladder. For resupply there is built-in filtration technology which allows for resupply from a simple creek or pond. Water from air solutions that manufacture water out of humidity are also an option when deployed in areas with no available ground water. Communications is maintained with both a multi sim card receiver station and when cell towers are unavailable, satellite dishes can support camp volume connectivity and band width. These solutions create an umbrella of connectivity that can both wake up local cell reception and power all internal networking operational technology. ElasticGrid™ Because the MRUs were designed to work together in a response camp, a grid was invented that allows each platform to share utilities. Power, water, and communications are daisy-chained from one unit to the next creating a fully self-sufficient utilities grid that expands and contracts with the addition or subtraction of each MRU. Today, response success no longer needs to risk failure because of logistical issues with fuel supply, water supply or maintaining connectivity. This is a game changer as first responders can be tethered to a camp in the theater of response that is stable and responsive to their needs. Because utilities production is now local to the responders it dramatically reduces the risk of mission failure, particularly when mission failure most creates its own compounding disaster scenarios. World Housing Solution design/ builds a variety of functionality into the Mobile Response Units including Clinics on Wheels. These clinics are currently providing equivalent medical care comparable to what is expected in a licensed health care facility. These Clinics on Wheels create their own power and communications, supporting telemedicine consultations and providing clean power to all sensitive medical equipment. The future of disaster response is already here and being deployed. If you want to get on board, let us know.